The magnetic force for permanent magnet can stay for a long time but it is not really permanent. There are 8 factors which will affect magnetic force. The strong magnet is very sensitive to working temperature, especially for sintered NdFeB magnet. The momentary and continuous highest temperature of the environment may cause certain demagnetization including recoverable and unrecoverable, reversible and irreversible. According to working temperature range 80-200 celsius, sintered NdFeB magnet is divided into several grade series (N, M, H, SH, UH, AH etc.). The cost will be expensive for high working temperature grade. So you need to consider your working temperature and choose the right grade. The loss of magnetic force can be ignored under working temperature permitted range. But magnetic force will decrease rapidly while working under a limit working temperature for a long time. Material formulation limits magnetic properties fundamentally. Sintered NdFeB magnet is the strongest and alnico is the weakest. There is also the difference for the same material based on formulation. The magnetic force for grade N45 is higher than grade N35 for the same size magnet. Magnets come in all shapes and sizes, and are used for a great variety of purposes. The shape of a magnet determines how the magnetic field lines are arranged outside of the magnet, which affects what the magnet can be used for. All of the methods you mention have been and continue to be used to manufacture magnets. Some small ones may be stamped out of sheet metal. Others may be cut from blocks of metal. Others still may be poured into molds. Refrigerator magnets are probably made of molten plastic with iron powder mixed in, poured on a flat surface, and then cut into rectangular (or other) shapes. The magnetization procedure usually involves heating up the magnet and then cooling it off with an external magnetic field applied. Magnetic force will reduce while placing opposite poles around the magnet, only when the magnetic field of opposite poles is several times larger than magnet itself, the reduction will be evident. Only when fully charged, the magnetic force can be achieved completely. Different magnetized direction, the magnetic force is different. For a cylinder magnet, magnetic force by axial-magnetized is stronger than diameter-magnetized. 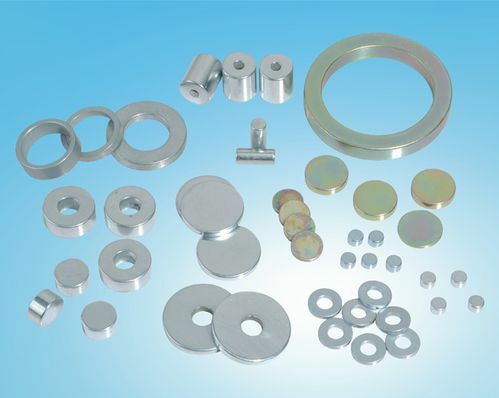 Sintered NdFeB magnet is easy to be oxidized and then loses its magnetic force. We use a coating to avoid this problem. But this is not a permanent solution. So the dryer it is, the better it is. It will reduce magnetic force, but needs a long time.